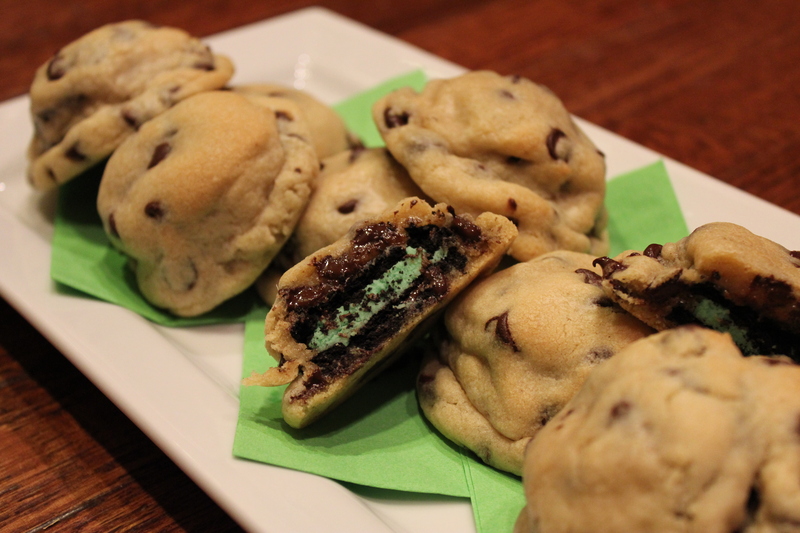 Mint Oreo Stuffed Chocolate Chip Cookies for St. Patty’s Day! St. Patrick’s Day is just around the corner, and if you’re like me you’re really feeling the itch to pinch someone if they aren’t wearing green! While green clothing is easy to pull off, green food is a little more difficult. That is unless you want to eat green peas! While I posted a link on my Facebook page for Irish Soda Bread, it wasn’t exactly festive enough in color for me, so I headed out to the grocery store last night to find something GREEN to make for the big day! I had all intentions of making Mint Chocolate Chip Cheesecake Brownies from Sally’s Baking Addiction, but unfortunately Kroger did not have peppermint extract and I was not about to grocery store hop to try and find it. Instead, I searched Kroger for something green and discovered Cool Mint OREOs! I adapted Picky Palate’s traditional Stuffed Oreo Chocolate Chip Cookies to make mine have a green OREO creme filling when you took a big bite into the cookie…. my solution for a St. Patrick’s Day treat!!! If you want to impress your friends, make these cookies. They are one hunk of a cookie. They look hard to make and it looks like you spent a lot of effort baking these. Good News: The recipe is VERY simple. 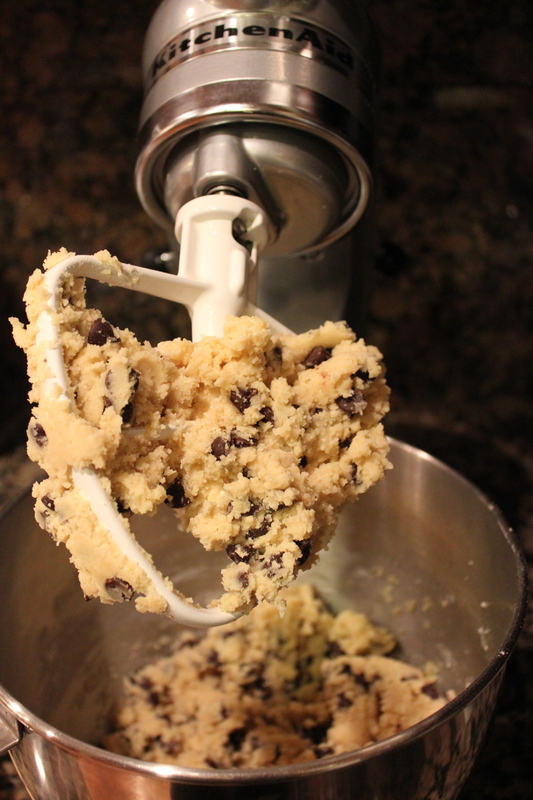 Start by making cookie dough, just like you would for any chocolate chip cookie recipe. 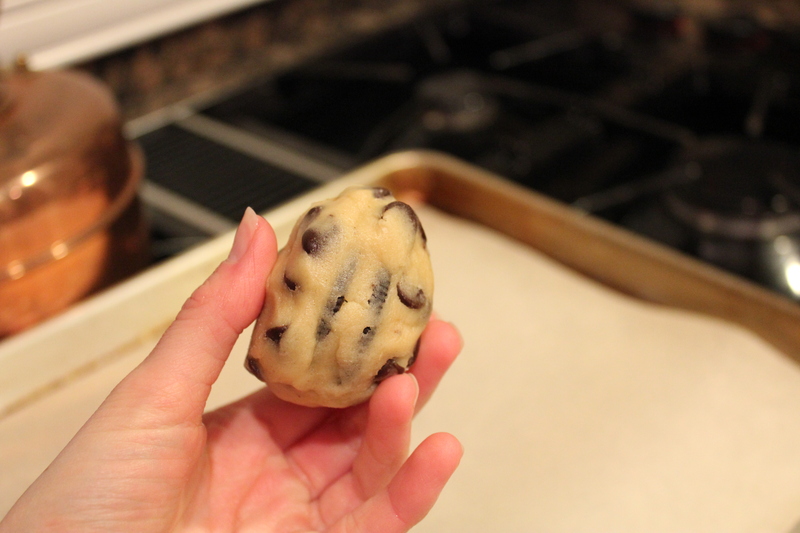 Instead of making one cookie dough ball, make two. 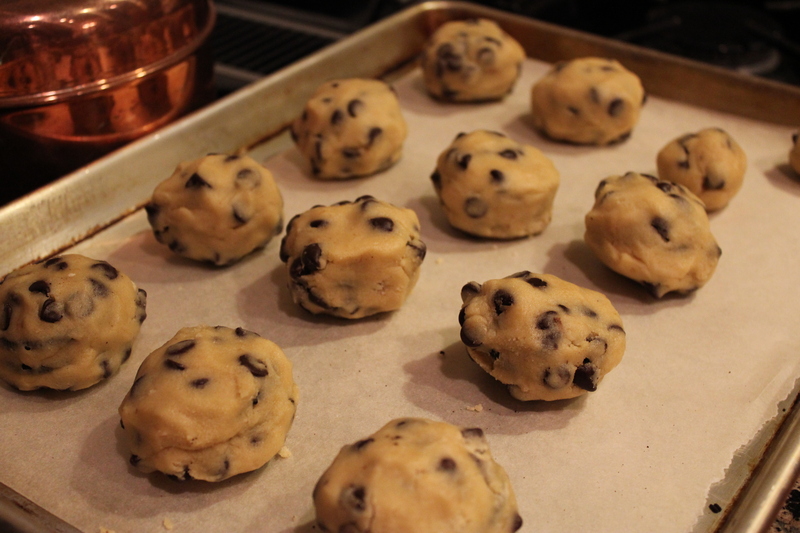 Then flatten the cookie dough balls around the OREO… kind of like an ice cream sandwich. Make sure you cover the edges so you don’t see the OREO. 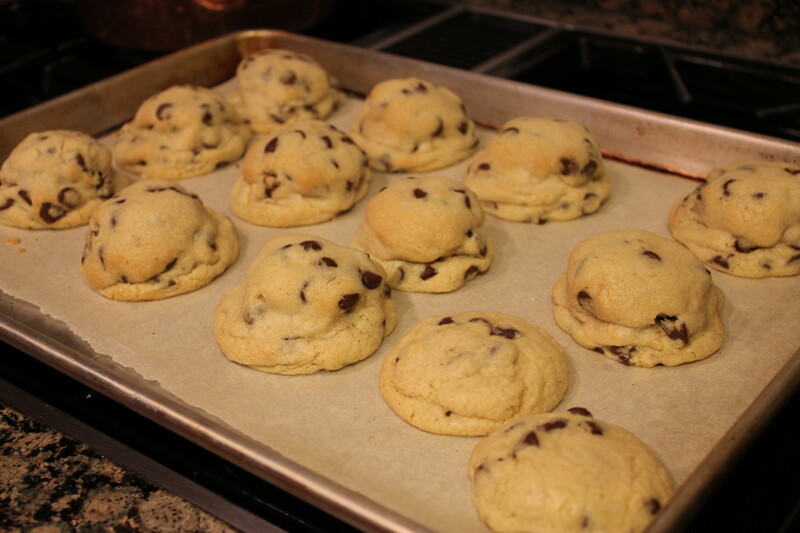 Place all the cookies on a parchment-lined baking baking sheet and pop into the oven at 350 degrees for 11 minutes. Let cookies cool and enjoy with a tall glass of milk! My boss tried one and was blown away by the size of these. He was about to take two cookies, but decided to be good and start out with only one. Halfway through he started to get full and questioned himself if he could finish it or not! Rich, sweet, cookie dough goodness. Bring these out on special ocassions and enjoy! 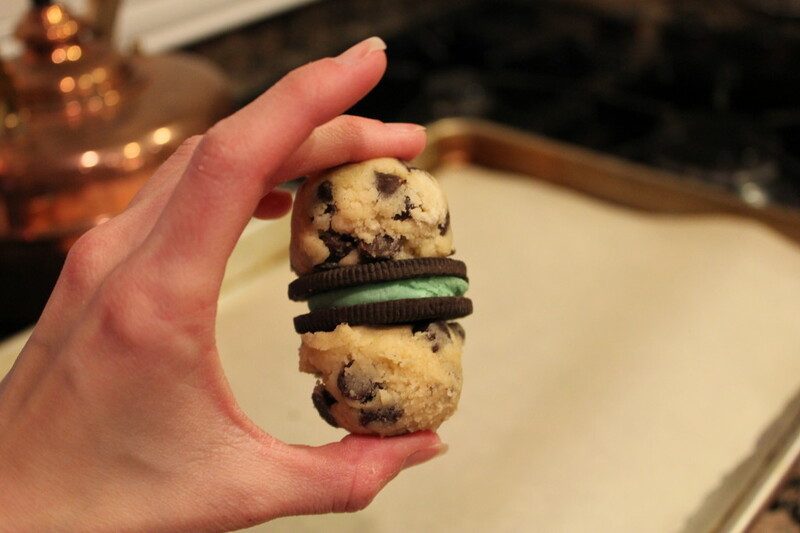 Mint Oreo Stuffed Chocolate Chip Cookies for St. Patty's Day! Preheat oven to 350 degrees F. In a stand mixer cream butters and sugars until well combined. Add in eggs and vanilla until well combined. In a separate bowl mix the flour, salt and baking soda. Slowly add to wet ingredients along with chocolate chips until just combine. Using a cookie scoop take one scoop of cookie dough and place on top of an Oreo cookie. Take another scoop of dough and place on bottom of Oreo cookie. Seal edges together by pressing and cupping in hand until Oreo cookie is enclosed with dough. Place onto parchment or silpat lined baking sheet and bake cookies 11 minutes or until cookies are baked to your liking. Let cool for 5 minutes before transferring to a cooling rack. 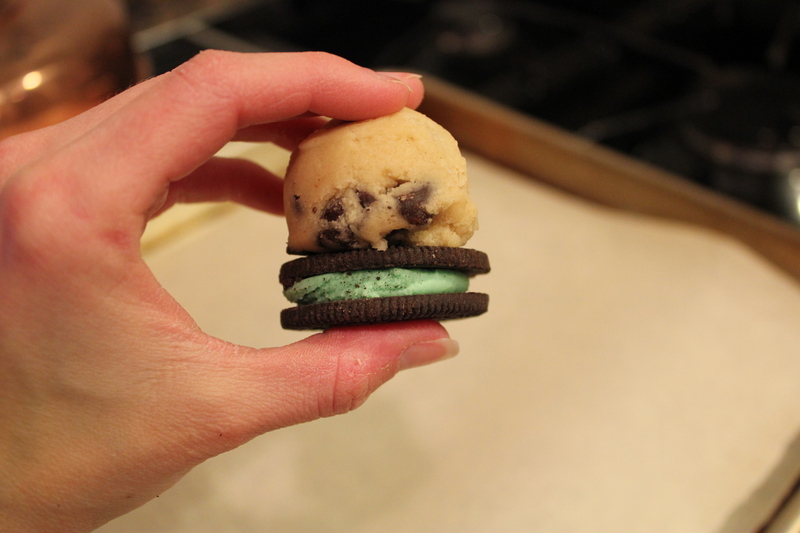 5 Responses to "Mint Oreo Stuffed Chocolate Chip Cookies for St. Patty’s Day!" These look wonderful! I like the mint Oreos better than regular. And putting any type of Oreo into a chocolate chip cookie is something I’ve always wanted to try. Love how fat and thick they get! I could eat these all year round, not only for St. Patty’s Day! How many cookies did this make? I believe it made about 2 dozen. Have you tried them yet? I did! They are soooooo delicious! Making them again tomorrow.